MONTREAL TRAVEL MUSE : Le Procope, in Paris: Napoleon's Hangout! 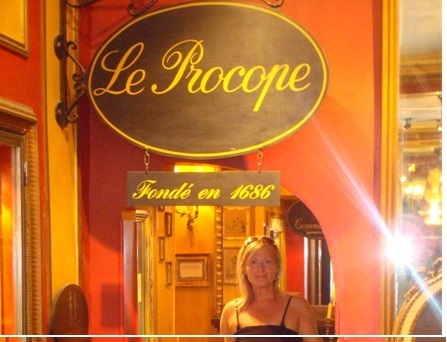 Le Procope, in Paris: Napoleon's Hangout! Winding cobblestone streets and a back road lane transformed by a colourful mish mash of cozy tete-a-tete tables where lovers dine and and sip their wine near merchants selling their fruit- a very bubbly and happening place this short winding street. This is where by pure chance I stumbled upon the back way entrance to the very famous “ Le Procope”. This happens to be the cafe where Napoleon used to hang out! At the very entrance there’s even his hat! 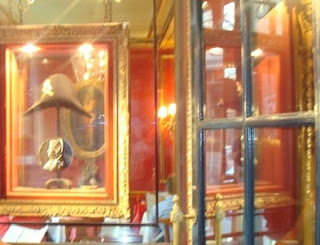 The story has it that during his ‘poor’ days, Napoleon pawned his hat to be able to pay his bill. This is more than a charming place- it’s filled with history. The whole place is decorated with memorabilia of the times and photos cover the walls. There is a lovely room upstairs where Napoleon and his political crowd gathered for discussions, good wine and great food. Disappointed that we had already had lunch (apparently the place serves the finest French delicacies), hubby and I settled for their renowned coffee and sorbet (apparently still the same recipe!!) – delicious:) The staff was also extremely kind to us (seems like all of Paris was enthralled with our Quebec accent;) Anyway, they let us roam the place and take some photos. I think I had the best time in Paris right in this very place where Nappy himself enjoyed himself most. Memorable. Honestly, I think I felt his presence more here than Malmaison! I see this interesting sign...hmm...Voltaire, I'm not impressed!